Government officials are going after primary and secondary school students to fill their minds with atheist ideology. 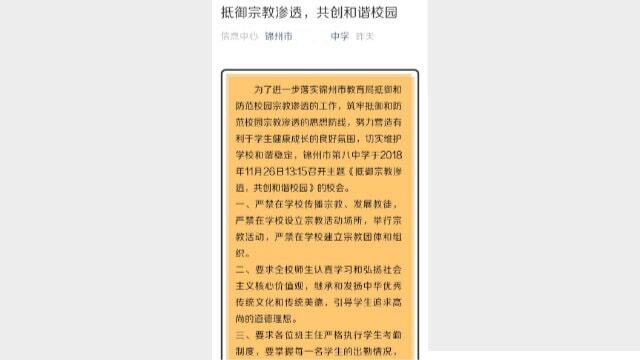 Those are the words the Chinese Communist Party (CCP) is now requiring students to sign on to in its quest to indoctrinate every Chinese person with a hatred for religion so that it can stamp out all traces of it in China. Last August, the Education Bureau of Lishan district in Anshan city, in China’s northeastern province of Liaoning, issued a plan for the campaign to resist religious beliefs in kindergartens. The document says that kindergartens are prohibited from hiring teachers who hold religious beliefs. Of the teachers that are already in place, the supervision must be increased – so much so that officials will now conduct comprehensive inspections of teachers’ preparation for lessons in order to root out any and all religious content. 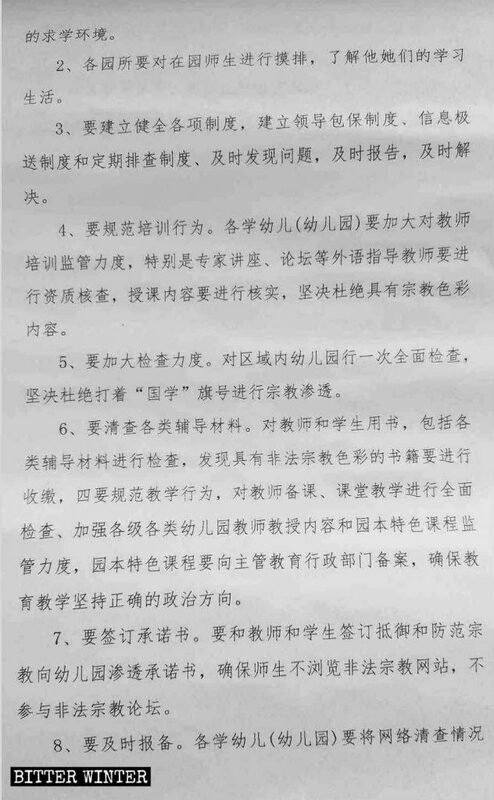 A plan for the campaign to boycott religion belief, issued by the Education Bureau of Anshan city’s Lishan district. Teachers and students in schools are also now required to sign a commitment statement promising they won’t browse religious Web sites or participate in religious forums. 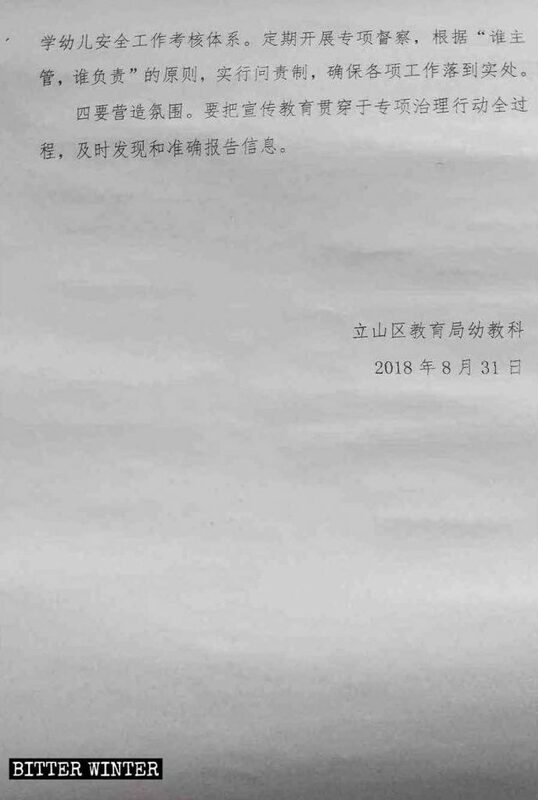 A notice prohibiting religious activities from entering campuses, issued by the Education and Sports Bureau of Pingdu city, Shandong Province. 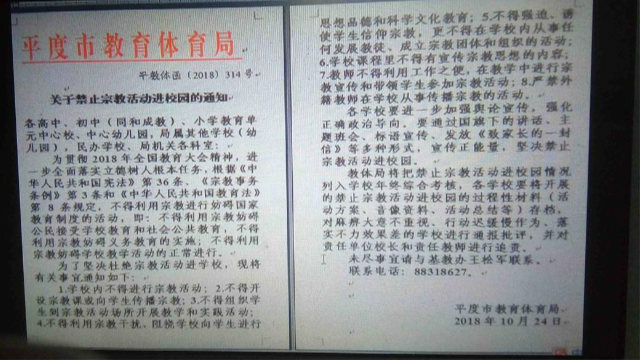 On October 24, the Education and Sports Bureau of Pingdu city, in China’s eastern coastal province of Shandong, also issued a document – this one aimed at kindergarten, primary and secondary schools – prohibiting students from participating in any religious activities. 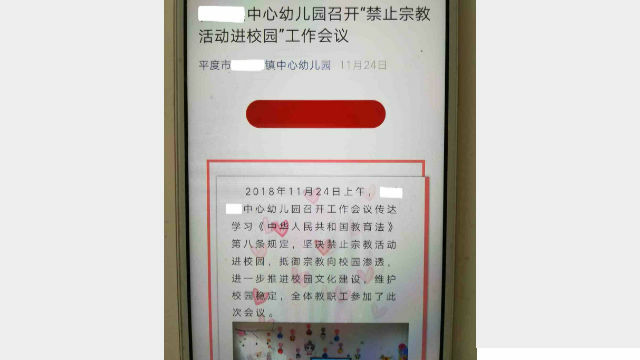 A WeChat message from a kindergarten in Pingdu city prohibiting religion from entering the campus. Some schools in the cities of Dalian and Jinzhou, in Liaoning Province, have also launched similar campaigns to boycott religion. 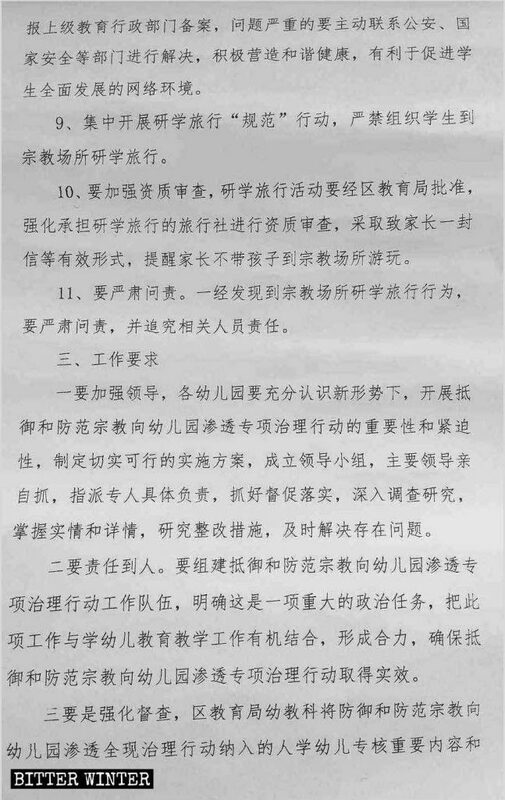 Anti-religious information published by a middle school in Liaoning’s Jinzhou city. Worse, in mid-October 2018, a primary school teacher in Liaoning’s Shenyang city has been trying to turn students against their parents, asking the children about their parents’ religious beliefs. If it’s discovered that anyone has a religious faith, they will be expelled from school. The teacher even incited the schoolchildren, telling them that if they discover that their parents or people around them have religious beliefs, they should immediately report them. 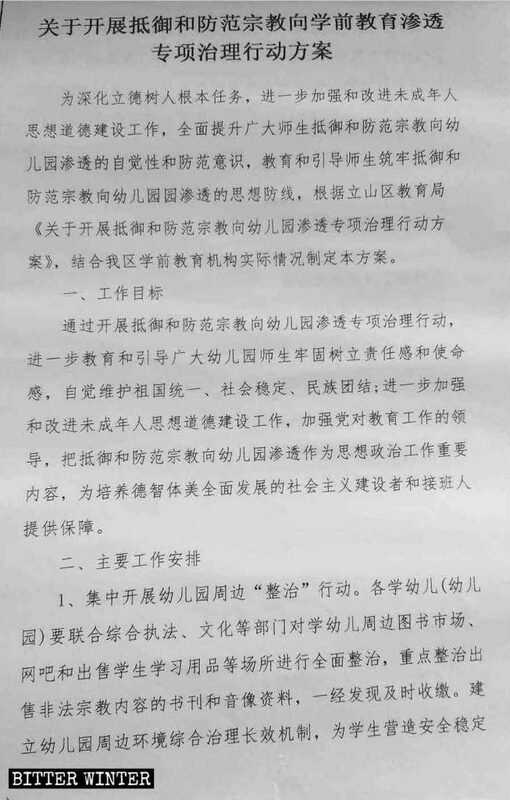 A middle school in Dalian city’s Jinzhou district strictly prohibits religious activities on campus. In late November 2018, a middle school in Nehe city, in China’s northeastern province of Heilongjiang, held a campus event, demanding that teachers and students sign a large banner “to reject religion from entering the campus,” and also demanded that the headteacher hold a class meeting “advocating science and rejecting religion from entering the campus.” All students were required to submit their notes regarding the boycotting of religious beliefs. Some parents believe that the forced indoctrination upon children is too much for their young minds to bear. And forcing them to sign documents denouncing all religion also goes to the extreme, punishing students who don’t sign. Like primary school student Li Nan (pseudonym), in Dehua county in Quanzhou city, in China’s southeastern province of Fujian. On September 28, 2018, he was threatened by his teacher. “If you don’t sign the notices, you needn’t take exams. If you still haven’t submitted the notices, you will be expelled,” the teacher told him, before using a teacher’s pointer to whip Li Nan on his palm three times. 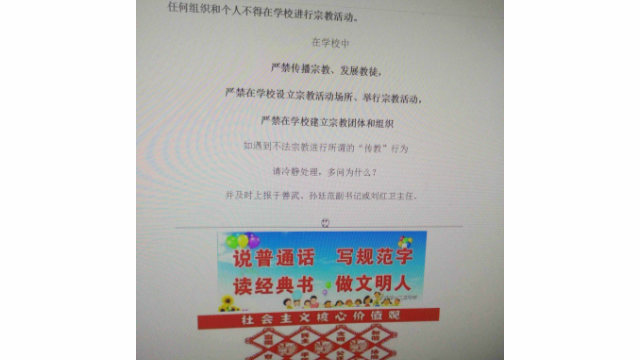 Bitter Winter has repeatedly reported that the CCP frequently carries out anti-religious education on primary and middle school students. Schoolchildren who do not sign their names in opposition to religion are physically beaten, causing students to live in fear.